The tree is central to the realm of the sacred; it is an upward extension the revered earth. 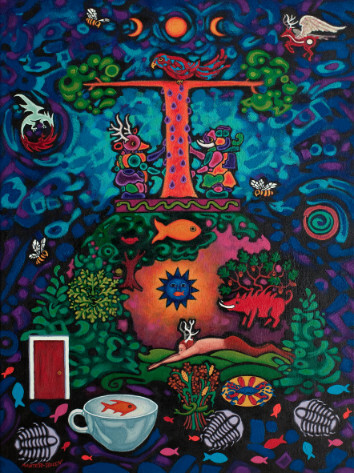 Venerated as divine, ‘tree’, encompasses an incredible variety of meanings… as a pole… center of ancient temples, as a pillar that represents the Great Goddess or Tree of Life as shown in both Crete and Mycenae… In Mexico the combination of bird and pole continues. Among the Mayans and Mexicans, the spirit is a bird that descends in order to impart life to the pillar. Among the Mexican and American Indians, crosses intended to invoke rain are commonly composed of tree trunks, each with two horizontal branches and a bird perched on top. 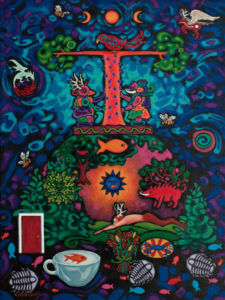 Among the Mayans, the Sacred Tree blossoms in the form of the ‘tau cross’ with a quetzal bird alight on the upper fork. Under the tree’s snakelike roots the great earth serpent arises, and from the trunk hang figs resembling human breasts. It is a peculiarity of the sycamore fig that the fruit stems from the stock of the tree and not, as in the common fig, from the branches. Two figures, …face each other across the tree trunk and reach out to pick the nourishing fruit for humankind. A small b&w illustration accompanies that text: Two figures pick figs from the sacred tree. Pre-Columbian Mayan Codex, Fejervary, Pre-Columbian. This simple (and tiny) illustration inspired the central theme. The motif of two symmetrical figures focused on a central pole or pillar universally crosses cultural and historical boundaries and therefore gains archetypal significance. The implied interior hill reflects the Irish fairy mounds which are said to be inhabited by an earlier race of beings. In folklore, the mounds only allow access at specific times and under certain conditions. The plethora of objects and symbols inside the hill reflect the beginning of creation and the “dreaming-dark” where ideas become reality – where abstract concepts assume a form.